This spring, the internationally-renowned Duke of Edinburgh’s International Award launched in the United States. This kickoff of pilot programs follows 60 years of success in more than 140 countries around the world. 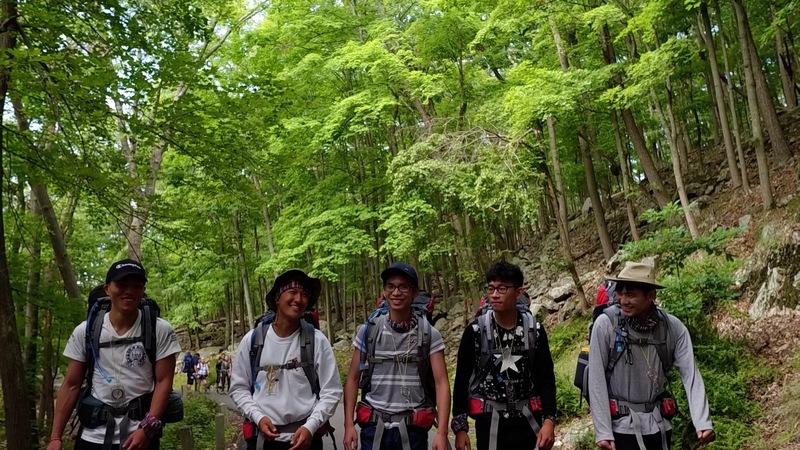 Globally, one of the most storied parts of a young person’s Award is their completion of the Adventurous Journey (AJ), challenging themselves and their peers to hike many miles and to camp on their own. The pilots included two different Adventurous Journeys, one AJ in western Michigan for Bronze-level Participants from around the country and Chicago-area groups and one AJ in the Hudson River Valley for Participants at Bronze, Silver and Gold levels, also from around the country and a New York high school. The AJs were a tremendous success of building teamwork, self-confidence, and resilience: skills that American young people need. The young people, Participants, ranged from 14-23 and came from across the country: Hawaii, Florida, Maryland, Minnesota, Texas. Although many people were originally invited to participate in our pilot VAP, the 18 or so who did were likely the heartiest of the bunch. At the camps, the individual Participants through the Virtual Award Program (VAP) joined the others who were participating through the local programs. The assigned journey teams were usually mixed between VAP and non-VAP Participants, creating a rich dynamic of people with longer histories with those hoping to establish new friends. The “camp style” AJ experience included a blend of cabin stays and dining hall meals (like a traditional summer camp) and nights in small backcountry tents with ultralight stoves on the trail. In order to reach American youth, The Duke of Edinburgh’s International Award USA (Award USA) designed new ways to connect across the miles. Pilot programs began in Chicago, San Francisco and New York. The pilots include designing a Virtual Award Program, the VAP, pairing young people who do not have access to an Award program in their community with a trained Award Leader to communicate virtually–by phone, video conference, email and text–to progress toward their Award. Corporate volunteers with RSM in both San Francisco and in Chicago have become VAP Award Leaders, working with VAP Participants to choose activities and set goals toward three sections of the Award: Skills, Service, and Physical Recreation. The Adventurous Journey section was managed, for this pilot, by the Award USA. The Award USA also began pilots with Chicago’s Union League Boys & Girls Club and the Boy Scouts of America’s local Pathway’s to Adventure Council, implementing the Award outside of a school setting, training staff and volunteers as Award Leaders. The pilots also included continuing to work with the International High School of the Health Sciences in New York, which had begun offering an Award program three years ago, but was uncertain about their ability to continue. Because VAP Participants didn’t have a local Award group with whom to implement the team-oriented Adventurous Journey, they and the local pilot programs were invited to participate in another US-specific innovation, the “camp style” Adventurous Journey. In June, the Award USA partnered with the Pathway to Adventure Council to host a Bronze-level AJ in Michigan with the Chicago-area Boy Scout council, Pathway to Adventure Council; in August, the Award USA hosted an AJ at all three levels with The Youth Development Agency, a company that also provides AJs in other countries. Both groups are trained and licensed as Registered Activity Providers (RAPs) to lead trips that follow the AJ requirements and conditions. A critical element of the training was not only building outdoor skills, but developing the young people’s team work and creating trust amongst the groups. In Michigan, that included several low ropes course activities; in New York, Participants played a number of simple games that demanded teamwork to succeed (and often produced tons of laughter). The Participant shown above, Elvin, shared that he felt that the group at the New York Adventurous Journey was “ohana,” Hawaiian for family. The PTAC and YDA staff were all experts in the outdoors, providing two days of navigation skills, meal and campsite planning and the rest of the necessary skills to succeed on a backpacking trip. Not surprisingly, compass and map skills was one of the most confusing and an important training elements: Participants reported that many practice journeys included wrong turns and miscalculations. But, these mis-steps were corrected through team work. It was clear the time spent building trust was crucial! And, with practice, each of the teams navigated their Qualifying Journeys successfully. The presentations from the Participants at the end of the AJ and the later texts, emails and photos and stories shared, demonstrate that the personal growth that occurred with each Participant was notable. Teens who were insistent on leading their team stepped back to include others; individuals who were anxious about setting up tents and cooking for themselves found that they can’t wait to backpack again; young people who tended to follow their peers are more confident to speak up–even in settings beyond the outdoors. If you’d like to be a part of the Award, contact info@usaward.org. The Award USA has opportunities for new Award programs, Registered Activity Providers and volunteers. If you or your child is doing the Award, post your photos and stories to #MyAwardUSA and watch the Award USA website and newsletter for Adventurous Journey options for summer 2018!